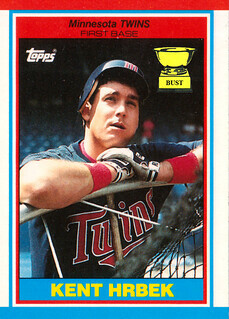 Kent Hrbek's train of thought from 4:16 to 4:17 p.m. July 21, 1988: "Hmm ... what am I doing here? ... Hmm ... Oh, that's right, I'm here to play baseball. ... Baaaasssseeebaaallllll ... Man, this helmet doesn't fit right. ... It's so small. ... In fact, this whole environment seems small. ... Whoa. ... It's like I've shrunk. ... What is happening around me? ... Where ... am ... I? ... It's as if I've become ... mini. ... I'm mini. ... Damn you, Topps! ... Damn you!"